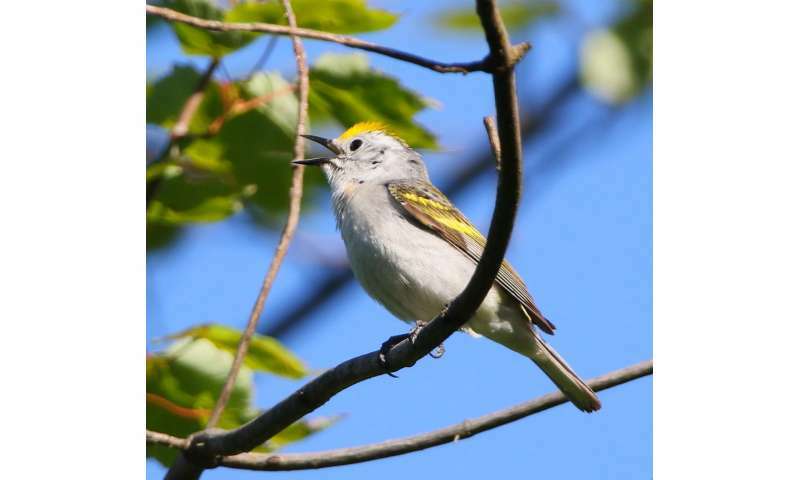 Scientists have shown that a bird found in Pennsylvania is the offspring of a hybrid warbler mother and a warbler father from an entirely different genus—a combination never recorded before now and which resulted in a three-species hybrid bird. This finding has just been published in the journal Biology Letters. "It's extremely rare," explains lead author and Cornell Lab of Ornithology postdoctoral associate David Toews. 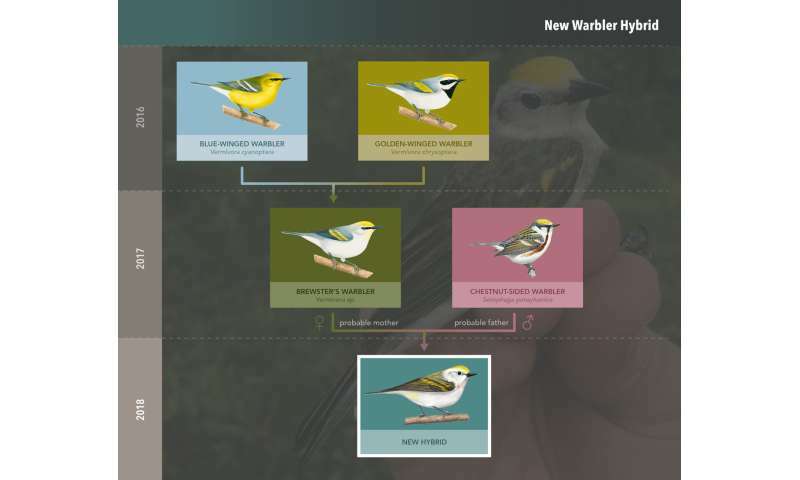 "The female is a Golden-winged/Blue-winged Warbler hybrid—also called a Brewster's Warbler. She then mated with a Chestnut-sided Warbler and successfully reproduced." "We looked at the genes that code for different warbler colors," Toews explains. "This way we could recreate what the hybrid's mother would have looked like—the avian equivalent of a detective's facial composite, but generated from genes. 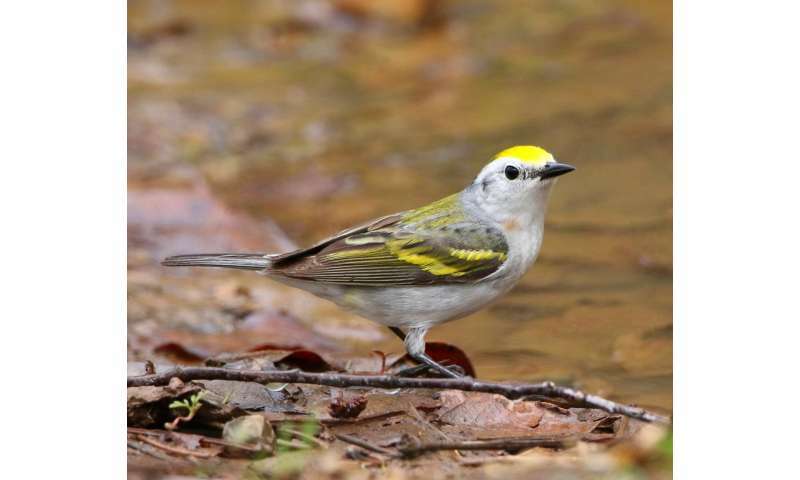 We confirmed that the mother would have looked like a Brewster's Warbler and the father was a Chestnut-sided Warbler." I propose this question "If you came across a Dachshund and a Great Dane in the woods and had no knowledge of humans history with dogs would you call them the same species?" The taxonomy system is a great help for biology but it is flawed. Think about the reality of dog breeds. We didn't use magic to create them. We used the same system that nature uses to produce them. Just because we were choosing the animals to breed doesn't mean they are excluded from our system of taxonomy. And our system of taxonomy would never list a Dachshund and a Great Dane as the same species, much less the same genus. That is why the taxonomy system is extremely flawed.